Build your stubborn back with Meadows Row exercises! Start by loading up a manageable weight on the bar. You don’t want to go too heavy since you won’t be able to complete the full range of motion. Using too heavy of a weight on any back exercise can be a recipe for disaster. You only have one spine, protect it! Especially with this exercise, it’s too easy to load up too much weight on the bar and feel compelled to row the weight, even if it’s too heavy. Stand on the floor next to the business end of the bar. Grab the handle with one hand and execute the row with it. Make sure you use straps – you don’t want your grip to be the limiting factor. To perfect this exercise, you need to learn how to position your hips to maximise the stretch and involvement of the entire lat, especially the lower lat. Raise the hip closest to the bar up higher than the other hip. This helps pre-stretch the lower lat. As you row, don’t twist your body. Keep your body position locked in and just drive your elbows up hard. Unlike some exercise variations, this one delivers big time. The fact is, this exercise is more responsible for the mass and detail put on your lats than any other, and is a great go-to exercise for anybody with a stubborn back. Should I use lifting straps? ABSOLUTELY! This isn’t a bicep exercise. This isn’t a forearm exercise. We’re working our back! 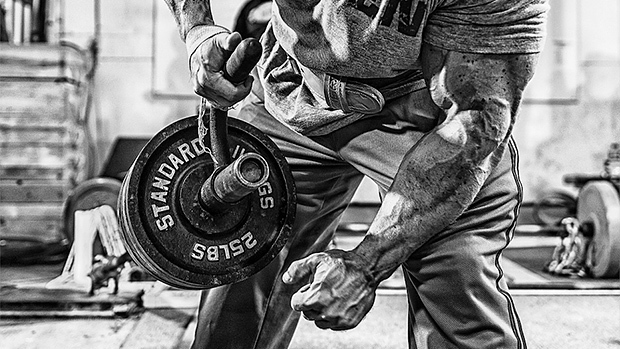 Save your forearm work for another day. When you use lifting straps, you can negate any issues you have with grip strength. It’s one variable you can cut out and help you focus on feeling the Meadows Row in your back. Go for 4 sets of 10. Use 25-pound plates to get a better stretch.